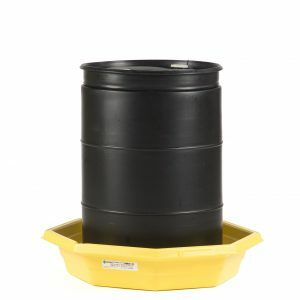 Inexpensive Containment For 16-Gallon Drums And 5-Gallon Pails. Need temporary protection against incidental barrel spills? Our Drums-Up and Drums-Up Jr. let you control nuisance spills from drums sized up to 55 gallons. 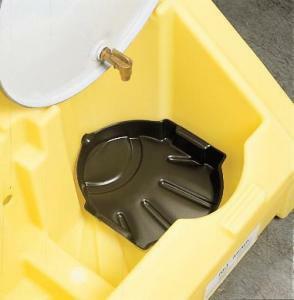 A 19.5-gallon sump capacity catches liquid before it reaches your floor, reducing the risk of slip and fall injuries. The NEW Mini Racker-Stacker™ System is ideal for storage and dispensing of small containers with built-in spill protection and patented enclosed sump. The system has a mobility option to make movement in the plant environment safe and easy too. The Mini Racker-Stacker™ System helps save liquids that are routinely lost during the dispensing process and helps protect worker safety by keeping the dispensing area neat and clean. Its wheels and handle make the Mini Racker-Stacker™ Mobile Unit portable throughout the plant. It easily fits through standard doorway openings. 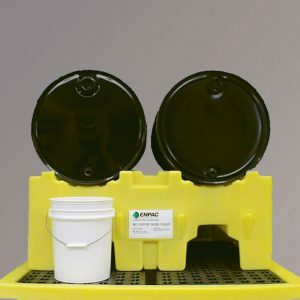 Made of highly durable and chemically compatible polyethylene, ENPAC’s Mini Racker-Stacker™ System is equipped with patented enclosed sump so that spills are truly portable, and the user isn’t “stuck” when a spill occurs like with other larger competitive products. Maximize floor space with the Multi-Purpose Racker/Stacker. 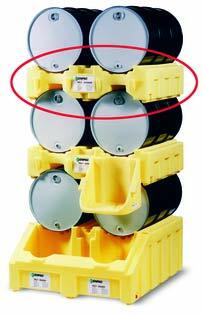 One Multi-Purpose Racker/Stacker holds up to two 55-gallon drums. The stackable unit allows you to double your efficiency and store up to four 55-gallon drums. The Racker-Stacker can be placed on the floor (no sump) or on the Poly-Slim Line 6000 pallet (Product No. 5400-YE). Use with the Poly-Shelf (Product No. 6003-YE as seen above) for easy dispensing into 5 or 6-gallon pails. Forkliftable! The centerpiece of the Poly-Rack System is the Poly-Racker, a unique one-piece polyethylene rack that holds two 55-gallon drums securely in place. 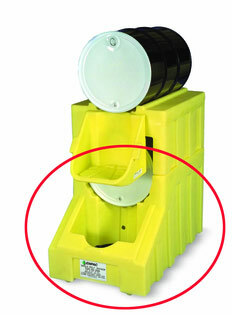 A massive 100-plus gallon containment sump ensures spill safety even in worst-case drum leaks. The deep dispensing well easily holds 5-gallon pails while containing incidental spills and splashes in a ribbed bottom without contaminating the sump. 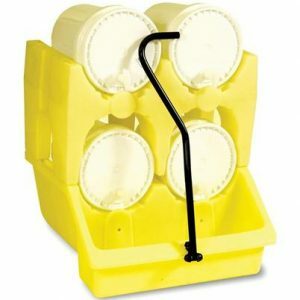 Dispensing wells have a scalloped edge so pails can be easily removed. 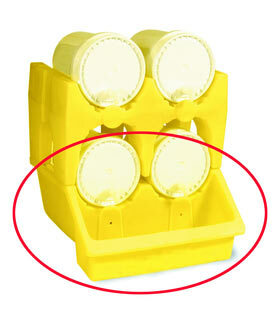 Poly-Rackers can be transported by forklift as separate pieces and contain two (2) standard drain plugs. Save money and prevent spills! Increase safety and productivity when you add the Poly-Shelf to your Poly-Rack System. It easily attaches to a Poly-Stacker and allows simultaneous dispensing from all drums. Spills? A hole in the bottom of the Poly-Shelf drains into the dispensing well in the Poly-Racker. Combine a single Poly-Stacker with a Poly-Racker to stack up to four (4) drums. Add another Poly-Stacker and you have a storage system that holds six (6) drums. Rated with a 3,000 lbs handling capacity. Economical, space-saving solution to storing and dispensing from 55-gallon drums. The system consists of separate single Poly-Racker, single Poly-Stacker, Universal Well Liner and Poly Shelf. 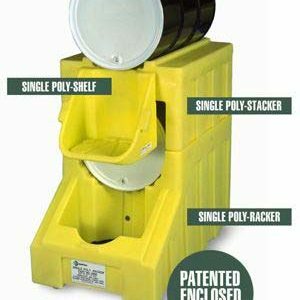 The Poly Stacker allows for stacking of a second 55-gallon drum. The system holds 1,600 lbs and the Poly-Racker features a 66-gallon sump capacity! Economical, space-saving solution to storing and dispensing from 55-gallon drums. The system consists of separate single Poly-Racker, single Poly-Stacker, Universal Well Liner and Poly Shelf. The Poly Stacker allows for stacking of a second 55-gallon drum. The system holds 1,600 lbs and the Poly-Racker features 66-gallon sump capacity! The Universal Well Liner provides extra spill protection. To reclaim spilled material, just lift up the liner.